Likely the simplest and most versatile distillation apparatus that one can make at home, is a pot still. Distill essential oils from aromatic herbs, flowers and seeds, oleo-resins like Frankincense, Myrrh, Pine and Spruce via hydro or steam distillation. Make grappa or moonshine from wine, mash or other fermented materials. Rectify and refine alcohol for medicine, perfume and liquors. As a civilization, we have been distilling for hundreds of years. The process of distillation is grounded in nature’s basic laws, simple and almost archetypal, lending itself easily to metaphor and myth, to allegories of purification, transformation, transcendence, and spiritual refinement. Through familiarity with the process of distillation, one can understand many of the old symbols, sigils, allegories and metaphors of the ancients. The “Art of distillation” is at the core of all alchemical traditions. It is the method by which the “subtle is separated from the gross”, and the process through with it is “married” back into its purified body and exalted at a higher vibratory rate. Modern chemistry owes much of its basic principles and processes, including distillation, to the ancient science and art of Alchemy. The apparatus for distillation is often called a “distillation train”, and is made up of 3 fundamental parts, each performing a separate function. The first is the pot, flask, retort or boiler, which with the aid of a heat source, evaporates and separates the volatile compounds from the material. (The essential oils from aromatic materials). The second part is the condenser which cools and condenses the hot vapours, returning them to a liquid state. The third part is the receiver where the distillate collects and the essential oils are easily separated from the water. Each part of the distillation train can be modified to perform extra functions, but this is the principal division of things. To make a simple pot still for steam or hydro distillation, one can use any clean metal kitchen pot with a tight-fitting lid. A hole is drilled in the lid to accommodate a pipe that directs the hot vapors to the condenser. A gasket of some sort is often required between lid and pot. Without a tight seal, any hot vapor that escapes the pot during distillation will carry your essential oils with it. Working at atmospheric pressure reduces the need for radical sealing methods and this can be accommodated by making sure the pipe leading from the pot to the condenser is wide enough to prevent buildup of pressure in the pot. It is sometimes possible to seal the pot with Teflon plumbing or gas fitting tape, which is inert and will not leach adhesives into your still. If needed an adhesive tape of some sort can be wrapped tightly around the Teflon tape to hold it in place. Pressure cookers can work as distillation pots and have the benefit of a fitted seal. Though contrary to the function they were designed for, pressure should not be allowed to build up pressure. Since writing this post 3 years ago, I have shifted away from using Aluminum pots as the one shown here. Though in theory, molecules of Aluminum will not transfer to the receiver or essential oil, and they likely could be used safely for distillation or steam production, it is impossible to know for sure and my focus has shifted to the more traditional and customary copper, stainless steel and glass distillation systems. In this case, a stainless steel pressure cooker will serve just as well as an aluminum version. Here is a PDF with instructions for building a “Magical” Couscousiere distiller. A recent distillation of Frankincense serrata with a Couscousiere. At atmospheric pressure and gently sealed with Teflon and electrical tape. Home Distillation-Homemade pot stills- pressure cooker with gasket less seal. When modifying a pressure cooker for home distillation there are some important points to keep in mind. it is likely a good idea to leave the safety release valve on your pressure cooker intact. Otherwise, unlikely as it may seem, if your exit vent gets clogged, a pressure cooker can turn into a deadly bomb. If using the pressure cooker for simple hydro and steam distillation remove the pressure gauge or the jiggly thingy, and drill through its threaded seat for your steam exit. Make sure you have at least a 1/2 of an inch diameter passage for the hot vapors to exit the pot. Since writing this post I now personally avoid any fittings that are less then 3/4″. 1 inch is my ideal on this sized pot. Pressure cooker pot still for essential oils. 2 adjustable joints make positioning the condenser and receiver a breeze. Easy to disassemble and clean between distillations. In the distillation shown here I used a 21.5 liter All American pressure cooker. This system is different from the more familiar “press and turn” locking system that most home pressure cookers incorporate. It provides an elegant and enduring alternative to rubber and silicone gaskets through a milled aluminum top and seat. No gasket is needed and the 6 screw down clamps create an even pressure and a perfect seal. Tighten them as you would the wheel on a car, in pairs of opposing nuts. This helps make sure the lid is sitting evenly and properly in its seat. I removed the pressure gauge, drilled a 1/2 inch hole and inserted a 1/2 inch brass fitting through the hole and screwed on a matching female fitting with Teflon tape on the inside of the lid. This diameter vent, (1/4″), is suitable for distilling liquids. Herbs resins, barks and other materials are more safely distilled using a larger 1/2″ to 2″ exit hole to avoid clogging and building up pressure in the pot. Adjustable couplings with elbows allow the pipe to swing horizontally and vertically to accommodate easy positioning of the condenser and receiver. All parts are available at most hardware stores. In this example, I use an electric hot plate as a heat source which is not ideal. Electric elements don’t disperse the heat well and can burn the material in a thin-bottomed pot, especially if there is a water-soluble component to the distilled material that will create a sludge. Even the smallest bit of burnt material in the pot can spoil the batch of essential oil. A thick-bottomed pot is ideal, as is a gas heat source. Though one can make a coiled copper tube condenser, or a metal water-cooled sleeve condenser at home, by far the easiest solution for the beginner is to purchase a ready made glass condenser. They are available from laboratory supply houses or eBay from about $20 to $60. I prefer to support small businesses and get mine from alchemylabsupply.com . A Liebig condenser is a simple glass “sleeve” condenser and an Alihn condenser has a series of glass “bubbles” to extend the cooling surface area. They range in length from 200 mm. To 600 mm. I find 300 mm to 400 mm. the most convenient. An antique, but functional Liebig condenser for distillation-400 mm length. The hot vapors pass from the pot, through the central glass tube, while cold water enters one end of the surrounding sleeve and exits the other, cooling down and condensing the vapors. I prefer these 2 condenser designs when distilling different materials since they are relatively easy to clean between distillations. Distillation of essential oils with pressure cooker pot-still and Allihn condenser. The water supply in this particular distillation is taken off a household tap and is collected and reused in the home/garden after passing through the condenser. All the adapters for the water hookup can be purchased at a hardware store. One can use a large pot of water and an aquarium pump to circulate cooling water through the condenser as long as one keeps an eye on the temperature of the water in the reservoir. It will warm up and become less effective overtime as it runs though the hot condenser. There is also the option of using an air-cooled condenser and I hope to go into detail around this option in another post. DIY Distillation-Home made Pot Still distilling Frankincense essential oils with an air cooled condenser. Last but not least important is our receiver. Any narrow-necked, clean glass vessel will do. There are ssyphonsystems that attach to the receiver and help with separating the volatile oils from the water. In most cases the oils will float on top. A simple method is to syphon or draw them off at the end of the distillation process and transfer them to a separatory funnel which allows easy removal of the heavier liquid from the distillate. If you intend to collect the hydrosol, make sure your receiver is sterile otherwise it is easy to introduce organisms that will quickly spoil it. Once the essential oils have been isolated they should be stored in a cool place. The distillation in the above pressure cooker pot still example was a hydro distillation of oleo-resins. As a general rule, I try to keep my water level between 1/2 and 2/3 the height of the pot.Any higher and there is a risk of liquid splashing or foaming over into the condenser, or plant material blocking the exit vent. Always measure exactly how much water you put in the pot. If possible use a graduated receiver that will easily show you exactly how much distillate has come over and thus, how much water is left in your pot..
For plant material that needs to be steam distilled, a sieve or perforated container can be suspended above the water. With a little improvisation it can be supported by the lid, sides or bottom of the pot. For an example see Distilling Frankincense essential oil. The amount of essential oil you will extract from different materials varies greatly. Oleo-resins yield much more essential oil per kilogram material than flowers for example, and even between different oleo-resins there is great variation. 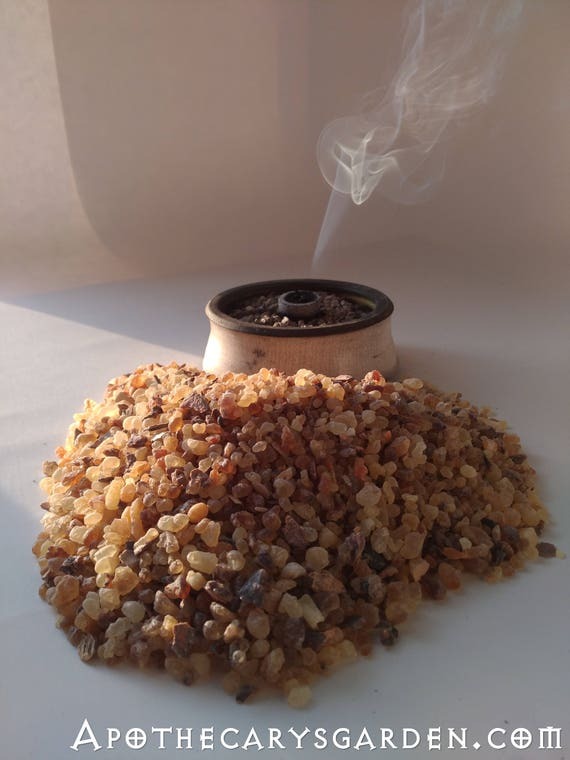 Some Frankincense types yield 0.05% essential oil, while others yield 10% and more. Some fragrant seeds are quite high in essential oil content and others less so. Fresh, or gently dried aromatic material is preferred for both quantity and quality of essential oil yield. Oleo-resins with no water-soluble gum content can be distilled by hydro distillation directly in the water. These include Pine, Spruce and Fir saps, Mastic, Elemi, Copals and Frankincense Frereana. 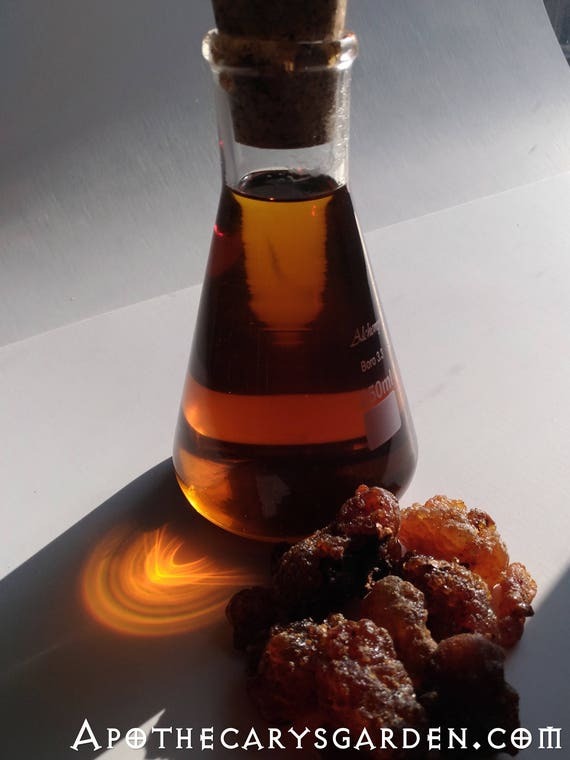 Oleo-resins with water soluble gum, or oleo-gum -resins such as most types of Frankincense and Myrrh, need extra attention when using a flat-bottomed pot still. They can be suspended in a sieve/colander above the water, or distilled very gently with a higher ratio of water to distilled material so less sludge and no burning occurs. The water soluble gums dissolve in the water and can create a slur that is apt to burn if the water level gets too low. When using flat bottomed pots, a thick bottom and a flame for a heat source, help reduce the risk of burning your material and losing the whole batch of essential oil. Aromatic seeds such as cumin, carrot, Dill etc can be distilled either suspended in a sieve or gently and directly in the water. The beauty of water and steam distillation of this type is that you will never go above 100 degrees Celsius in the still, which is suitable for distilling most essential oils for apothecary, perfume and aromatherapy use. If a hole is drilled in the pot lid, a thermometer can be inserted through a cork, and the temperature of the vapors can be finely controlled. This is important when distilling alcohol for instance. I’m sure I have missed some important points. So feel free to leave any questions, ideas, insights or omissions in the comments section below. They are most welcome and appreciated. First Copper Distillation of the year! Thank you so much for this wonderful article!! I am looking for a little more detailed instruction on how to connect the copper pipe to the lid, it says to use teflon and screw a female piece? What would that look like? and how to connect the condenser to the pipe? You can use a Clevenger apparatus to distill Frankincense though cleaning the flask will require some finesse. You are correct that the resin with all the Boswellic acids will stay behind and it is indeed a very valuable compound for cremes, salves and many other products. You have to be careful to not distill out all the water because the water soluble gum will be dissolved in it. It will get concentrated in the flask water and may burn towards the end of your distillation and contaminate your distillate. I suggest keeping an eye on the water level during the distillation and even adding small amounts of water to the flask if needed. The best method of reclaiming the resin from the flask is to pour out the contents soon after you disconnect the condenser. I often pour the hot liquid into a tub of water then when cooled, run it through a kitchen sieve to collect the resin bits. It is easy to wash it under the tap to clean off any remaining gum. This resin will dissolve in warm oils and waxes and is an excellent base for medicated products. The flask will still need some cleaning this can be done with pressurized steam, alcohol, or a vegetable oil followed with hot soapy water. This is where a pot still has its benefits. Thanks for such a great information! I’m learning to distilling essential oils myself, but it’s not easy at all! Thank you so much for such a great information! I’m learning to distilling essential oil myself, but it’s not easy at all. Yes, it can be challenging!! But you know you can learn to do anything with time and practice. There is a good Facebook group that might be helpful to you. It is called “Artisan Essential Oil Distillers”. There are master distillers in the group and also novices and beginners. It is a place where people share knowledge and experience. I find the path is often easier when there are others who share our interests. Here is a link to the group. I’ll be using a pressure cooker for the extraction of essential oil of eucalyptus and many other plant material. For practical reasons, instead of drilling a hole through the lid, I plan on simply attaching a 1m silicone tubing on the steam vent and connect to the copper coil condenser. I know that silicone has high permeability to various gases. Do you think essential oil could be lost by crossing the walls of the silicone tubing when distilling? I could not find information specificly about this detail. Hi Anderson. I highly recommend drilling a hole 1/2″ to 3/4″ to in the pressure cooker otherwise you will be cooking the plant material under pressure and running a very real risk of explosion if the narrow orifice gets blocked by plant material and pressure builds up in the pot beyond its tolerance. If you did this and used 3/4 I/D hose, silicone might be an option to consider. I know it is supposed to be inert, but I too have seen no information on how it reacts with hot essential oil. I will not say that it will not work or that it is a bad idea… but I have had experience with terpenes being absorbed into silicon gaskets and causing them to expand considerably. This could be a problem. I’m considering trying something similar myself however I am only looking at using a 1 inch length of silicone to connect to my copper coil. It occurred to me while watching you fab a still from a Couscousiere, that a band cut from an appropriately sized inner tube might be useful as a seal. Used to bridge the gap between top and pot and pot to pot, all would be held together securely. O-RING material is also available in long lengths that can be cut to size and then glued end to end. Excellent insight Carl. Thank you for sharing that here! It would create a girdle in essence and as long as the material didn’t stretch or lose elasticity with the heat it could work well. Most distillers of alcohol seem to use rye flour paste as a gasket, and it works incredibly well for such a simple thing. A bit of a mess, but safe. First off, wonderful article. I found it educational. However, in your article you said that you were somewhat apprehensive of using aluminum and instead preferred to use copper. While I know that copper has been used for a very long time in distillation it should be pointed out that while there’s no real evidence that aluminum from cookware is toxic in any way copper definitely is and should not be used to distill alcohol for any reason. You should be much more worried about traces of copper in your distillation product than traces of aluminum. Other than that I enjoyed reading this. For that very reason, I prefer stainless steel. I’m pretty good at TIG welding it too. Do you need to use fresh herbs for distillation or can you use dried herbs? Some plant material, most often roots, bark, wood and seeds need to be dried before distillation. They are usually soaked in the still water from 1 to 3 days before distillation. Many of the leaf and tender aromatic plants need to be distilled fresh, but not all of them. There are some good books on the art of distilling essential oils online. Septimus Piesse and Steffen Arctander to name 2, and a true abundance of information online. I suggest you join an online community such as the Facebook group “Artisan essential oil distillers” and futher your education as needed. Hi Mr. Riegler, I have attempted to extract EOs using a set up very similar to the above posted pressure cooker method. However, all I seem to distill is a really great smelling hydrosol. My distillate is a white cloudy water that smells like the herb (peppermint, lavender, etc) but no oil settles to the top as is indicated it should do. Any suggestions as to what I may try to actually get some EO? Hi Jen. Thank you for taking the time to leave a comment and question. I apologise for the delay getting back to you! I believe you need to try distilling something that has a relatively higher content of volatile oils. Many types of plants will yield little essential oil when distilled, some less than 0.5% of their weight. At 0.5%, a plant material will give you 5 milliliters of essential oil. If plant material is not fresh it will have even less of the expected amount of volatile oil. If you are not distilling larger quantities of such a material, you will likely not see much essential oil floating on your hydrosol. Keep in mind that whatever essential oil you did succeed in extracting, will be imperceptible when floating on a wide surface and may only become visible when it sits at the narrow neck of a vessel. A small quantity of essential oil can disappear in a large receiver as residue and beading occurs on the walls of the receiver and “steals” what little oil you have produced. 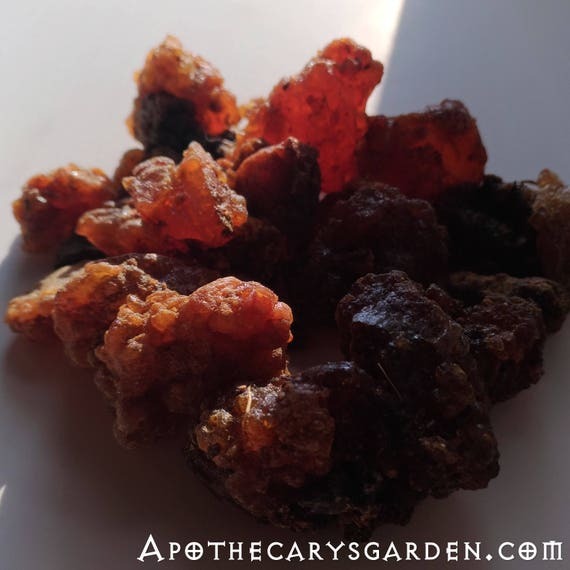 I suggest you try distilling a material with a high volatile oil content such as any of the oleoresins or oleo-gum-resins like the different types of Frankincense. If you have access to pine or spruce trees, their oleoresin, or sap could provide you with a more gratifying distillation experience. Many of the spice seeds we can buy in bulk have a high ratio of volatile oils, just make sure they are fresh and fragrant. Caraway, Cumin, Dill and many other spices should work nicely. I wonder what size of a pot still you have, a small still will limit the volume of material you can process and essential oils you can collect. I would also check to make sure you have no vapors escaping from your still, this too could drastically reduce the yield from your distillation. If you continue to have issues with your distillation, please send me a photo and information on your set up. I hope this was of some help Jen, and please don’t hesitate if you have further questions. I promise to respond more quickly! I am wondering about the use of aluminum pots in this process… is there any concern of leaching the aluminum into the finished product? Thank you for visiting and for an excellent question..
To the best of my knowledge, only volatile compounds come over in the evaporation process. This is in essence the same as when water is boiled and distilled. During the distillation process the water is evaporated and recondensed, purified of minerals since they will not evaporate at 100 degrees Celsius and stay behind in the boiler. The only way aluminum or other minerals could come over into your receiver is if you experiences some “splash-over”, where the contents of your pot still entered the condenser in their “solid” or liquid state. For this reason it is important to leave enough headroom, ( about 1/3), in the pot so vigorously boiling water, (or any frothing of material), will stay in your pot and nothing other than vapors will pass through your condenser. This is usually apparent if your distillate is not clear and if it contains particles. Fantastic distillation article. I just bought a handmade copper alembic from Portugal a month ago. Can’t wait to get distilling! Thank you! I have always wanted to try one of those… you’ll have to let me know how it works for you.